For the most part, Tuesday’s rains were as expected. Most of the greater Houston area received between 1 to 3 inches of rain with isolated areas receiving as much as 6 to 7 inches. The heaviest rains caused localized flooding that were primarily limited to those areas. Overall we should see less rain today than we have the past two days. We have the potential to see a few rain bands move through the area which could bring another 0.5 to 1 inches. Some of these bands could bring higher amounts to isolated areas. Already this morning, portions of Matagorda County, western Brazoria County, and southern Fort Bend County have received about 0.5 to 2 inch of rainfall with a couple of areas that appear to have received about 5 inches. The good news is that it appears today’s rainfall should be the end of this event with the extended forecast calling for sunny to partly sunny skies with highs in the low 90’s through next Thursday. 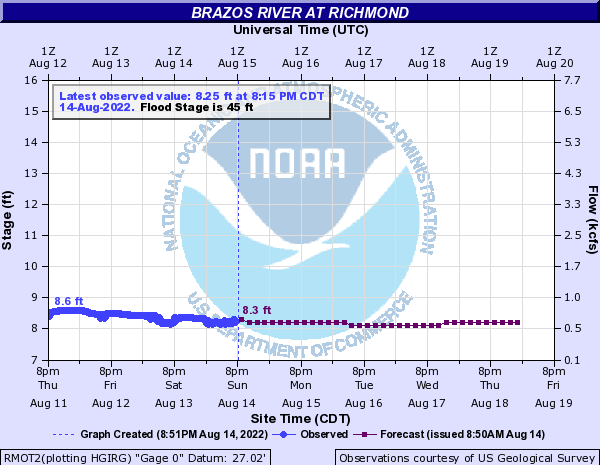 Over the past 24 hours we saw the Brazos River in Richmond rise about 6 feet peaking around 15.29’ (Gage) primarily due to the rains that fell downstream of San Felipe. There is some additional water making its way downstream from Hempstead, but there is currently no flood threat along the Brazos River as we should see the water level return to normal conditions over the next several days. I have been asked about our weather updates and if we will continue to provide updates moving forward similar to other sources found online, such as Space City Weather and the answer is no. Those guys as well as a few other sources do a much better job than we can do. Our purpose for this site is to provide resources related to floodplain and flood risk management. That being said, during times of increased weather threats, we will use those sources to provide specific information related to those threats and their impacts along the Brazos River and surrounding watersheds. If anyone ever has any questions, comments, or suggestions to any of our updates or content, feel free to Contact Us.